Q.1 How much will MICHIBIKI's supportive role to the GPS (*) help make our lives more convenient? In addition, if any anomaly occurs in a QZS or the GPS, it will be notified very quickly to users (within about 20 to 30 seconds) by monitoring from ground stations as the positioning reliability will improve with the QZSes. What is "GPS complementary"? The MICHIBIKI transmits almost an equivalent positioning signal as the GPS signal. By combining the MICHIBIKI and the GPS, the area and time of positioning availability will be expanded. * With only one QZS, we can see the MICHIBIKI above us in the Tokyo area for about eight hours per day. With three QZSes, the QZS system can cover for 24 hours. By transmitting the GPS equivalent signal, it has the same effect as one more GPS satellite flying above you. The figure below is the simulation result of positioning only by the GPS and with the GPS and the QZSS. 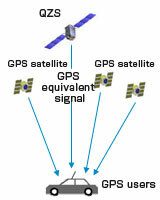 It indicates the time percentage of possible signal reception with four or more satellites that are necessary for positioning in the Ginza District in Tokyo. In small alleys and shaded areas by buildings, the time percentage of positioning availability from all four satellites is low, but, with the QZS, the time percentage drastically goes up, and the blue area of 90 to 100 % is expanding on the figure. One of the major objectives of the QZS is to complement the GPS to improve the time percentage of positioning availability. Q.2Why are there many protrusions like horns sticking out from MICHIBIKI's head? A.2 The horns are helical array antennas that can make signal strength constant and uniform when the signal is received on the ground. The multiple number of satellite positioning systems, including the American GPS, Russia's GLONSS, and EU's GLILEO, share the same radio frequency; therefore, each satellite has to make the output signal strength constant and uniform within a certain predetermined range. Unlike other positioning systems, the MICHIBIKI flies on an elliptical orbit whose distance from the ground changes. The signal strength has to be constant when received on the ground by incorporating the changing distance to the Earth. In addition, the MICHIBIKI's orbit is higher in altitude than other systems, thus it has to transmit a stronger signal. For sending stronger signals that are constant in strength when received on the ground, the MICHIBIKI has an array antenna composed of 19 helical antennas that look like horns. Actually, there are 19 horns sticking out inside of it. Surprised? To make a uniform amplitude distribution of the signal, an antenna pattern is formed in a dent shape. It is very high-tech. 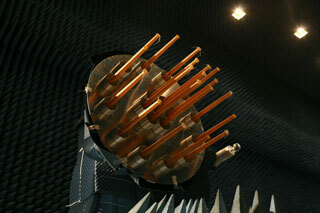 The MICHIBIKI's helical array antenna is the "L-band helical array antenna." It is an array antenna using an L-band consisting of (or arraying) antenna elements coiled in the form of a helix. The MICHIBIKI's antenna is made of 19 helical antenna elements, and it is an extremely high performance antenna with high gains to constantly transmit a uniform signal level to users on Earth, whose surface is curved, thus the distance between the satellite and the ground changes. Q.3 Tell me more about the special features of the MICHIBIKI! A.3 There are many special features of the MICHIBIKI. Let us explain two of them here. Firstly, the clock aboard the MICHIBIKI is incredible! For the above reason, the satellite is equipped with an extremely precise and highly stable "rubidium atomic clock." Furthermore, we take special care with electric wiring and temperature management to minimize the gap in the radio wave phase and frequency. Secondly, the MICHIBIKI is designed to promptly cope with signals in a new generation. It takes the future into consideration! Around the time of the MICHIBIKI launch, various new satellite positioning systems are scheduled to begin operations. The GPS is also scheduled to be modernized to begin transmitting new signals. The MICHIBIKI is designed to deal with not only current GPS signals but also future ones. Q.4 Can we receive signals from the MICHIBIKI anywhere in Japan? A.4 The MICHIBIKI transmits positioning signals all the time, thus you can receive them not only in Japan but also in other parts of Asia and Oceania. 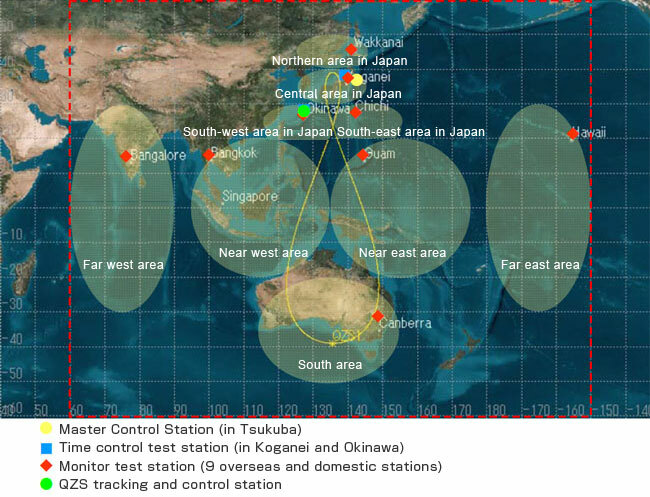 Positioning monitor experiment stations are set up mainly in Japan as well as in other areas that can receive MICHIBIKI signals, such as in India, Thailand, and Hawaii, to receive and monitor the location and time information from the MICHIBIKI. In addition to the above experiment stations, there are ground support systems for the MICHIBIKI, and, among them, we would like to especially focus on the QZS tracking station prepared in Okinawa to operate the MICHIBIKI 24 hours a day, seven days a week. The station's antennas are covered by a dome for coping with adverse weather conditions including typhoons. Let MICHIBIKI-san explain more about the station. Until the MICHIBIKI is injected into the quasi-zenith orbit, the conventional JAXA ground network system (GN) will be used. Q.5 Why it the MICHIBIKI main body black? I am often asked why my main body color is not gold like AKATUSKI-san and IBUKI-san, but black. It is the color of the multi-layer insulator (MLI) pasted on me. The type of insulator depends on the satellite. I am in a category of geostationary satellites, and the recent geostationary satellites including the KIZUNA-san (WINDS) and KIKU No. 8-san (ETS-VIII) are also black. The black MLI is slow in the deterioration of thermal optical characteristics, thus black ones are used more for geostationary satellites, whose life expectancy is usually longer. My design life is 10 years, which is fairly long, thus I have to work hard to keep staying healthy.